These Korean BBQ Jackfruit Sliders are everything. Jackfruit has become a bit of a big deal over the past year, and for good reason. Late last year I made this Smokey Slow Cooker Pulled Jackfruit Chili and that was my first introduction to this meat-disguised fruit; it was divine. But over the past year, after reading further into jackfruit and its uses, I’ve come to learn that the *real* trick to enjoying jackfruit is to throw it in a recipe where it can mimic pulled meat, such as pork, beef, or chicken. Y’know, like on a saucy sandwich. So, when it came to feeding my girlfriends a few weekends ago while hosting a potluck, I decided to take a stab at it. With the help of Lee Kum Kee’s Panda Brand™ Sauce for Korean BBQ Stir Fry, I was able to create these succulent Korean BBQ Jackfruit Sliders. To say the very least, we lost our collective minds. And with that, I thought it would be unfair of me to keep a recipe like this a secret. Especially since jackfruit has become such a trendy ingredient and yet people are still wondering what the heck to do with it. My suggestion: make these sliders! With Labor Day coming up, I am urging you to slap these bad boys onto your guests plates. People won’t even *care* that there isn’t any meat in them. I hate using the exhausted (tacky) food blog statement of, “Even my husband loved it!”, BUT HE DID. And he’s a master when it comes to pulled pork, so y’know, it’s kind of worth mentioning in this case. Here’s the deal with Lee Kum Kee’s Panda Brand™ Sauce for Korean BBQ Stir Fry: it’s ah-mazing. Tailored to save you time in the kitchen, this good stuff is free of high-fructose corn syrup, MSG, and preservatives. Furthermore, you don’t have to add anything to the sauce. If you do want to add a little heat, I suggest adding a bit of gochujang, but other than that it’s ready to go right from the package so you can prepare a mouthwatering Korean BBQ-inspired dish in minutes. And you can make these sweet ‘n savory sliders in a measly 30 minutes. Simple ingredients = real flavor. Established in China in 1888, Lee Kum Kee has been loyal in supporting the Chinese culinary culture throughout the U.S. and beyond since day one. They offer over 200 authentic sauces and condiments made up of premium-quality, non-GMO ingredients; they also have several gluten-free options for those with special dietary concerns or restrictions. With that said, everyone gets to enjoy restaurant-quality East Asian tastes in the comfort of their very own home with minimal effort, thanks to Lee Kum Kee. These Korean BBQ Sliders are the *only* option this Labor day weekend! Elevate your feast with Lee Kum Kee and watch everyone’s eyes widen. 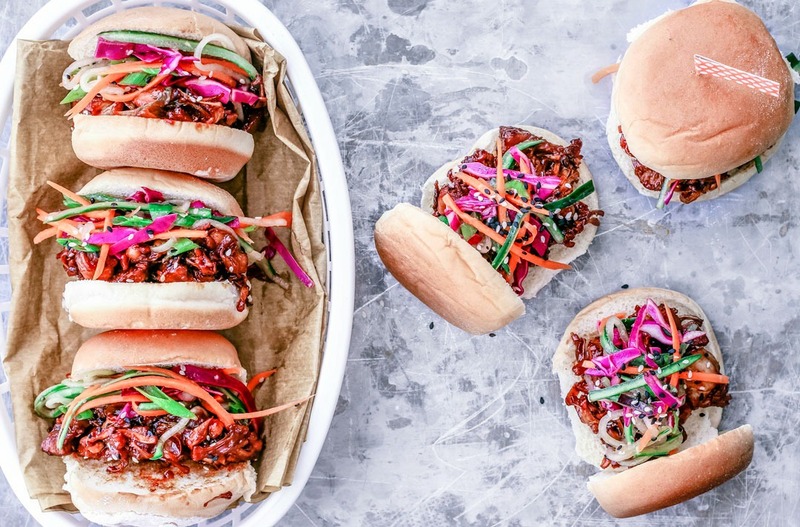 These Korean BBQ Jackfruit Sliders are sweet, savory, saucy, and topped with a crisp sesame slaw — perfect for entertaining! 2 20 oz cans of young green jackfruit Don't buy jackfruit in syrup; buy it in water or, if you have to, brine and rinse them once drained from the brine. Rinse, drain, and thoroughly dry your jackfruit with paper towels. Chop the center core portion of the fruit and discard the harder part in the middle that resembles the core of pineapple). Place the jackfruit in a mixing bowl and add the garlic powder, onion powder, pepper, and salt. Toss to evenly coat and set aside. Heat a large skillet over moderate heat, and add 1-2 TBSP of oil of your choice. Add the seasoned jackfruit and toss to coat in oil; cook for 2-3 minutes until jackfruit is lightly golden in color. Add the entire package of Lee Kum Kee’s Panda Brand™ Sauce for Korean BBQ Stir Fry and the sliced scallion. Toss to coat, and bring the heat down to medium-low. Cover, and allow to simmer for about 20 minutes, stirring occasionally (you can go up to 30 minutes for a richer flavor if time isn't a concern). Five minutes prior to your cooking time being done, grab two forks and shred the jackfruit like you would for pork or chicken when making pulled meat sandwiches. Stir well, cover, and let cook for remaining time. Once done, remove from heat and set aside. Place the julienned cucumber, carrot, cabbage, and scallion into a large bowl and toss. In a small bowl, mix together the sesame oil, rice vinegar, minced ginger, and sesame seeds. Beat the mixture with a fork until it's well blended. Drizzle the mixture over the vegetables, add the sesame seeds, and toss to coat using either your clean hands or a pair of tongs or salad forks. Set aside. Set out your slider buns and top each with a scoop, approx. 1/4 cup worth, of the jackfruit mixture. Then top each with approx. 1-2 TBSP of the slaw. Garnish with extra sesame seeds, top the sandwiches with the top buns, and serve. Want to spice things up? Add 1-2 TBSP of Gochujang to the jackfruit right after adding the stir-fry sauce, and mix well. I keep seeing recipes with jackfruit and want to try it. I didn't know you could buy it in a can! This sauce sounds amazing too! Yes! In a can is the best way. From what I've read, cutting into a jackfruit is no easy task — and even finding a whole jackfruit can be a challenge. Just make sure to get it canned in water, or brine (just rinse it if it's in brine). Definitely avoid the jackfruit in syrup, unless you're making dessert :) I hope you love it when you do try it! I haven't experimented with jackfruit yet but now I definitely need to! Especially with this amazing sounding bbq sauce! Yum! It's so good, Amy. I hope you love it. Jackfruit is a lot of fun! I am obsessed with both jackfruit and Korean flavors so I know this would be the perfect recipe for me! I also need to get my hands on the Lee Kum Kee’s Panda Brand™ Sauce for Korean BBQ Stir Fry! YUM! I'm the same, Vicky! I love jackfruit and Korean BBQ, so this was a dream. I made them for a girls night back in the summertime and it was a total hit. Lee Kum Kee's sauce makes it! Hey Julia, do you have any Asian markets in your area? They usually have it in stock with their canned bamboo shoots and water chestnuts. You could also try Whole Foods — I've had luck there! I hope you can find some. Wow :) looks so perfect! photos are gorgeous! I love how colorful the jackfruit topping is! Yum! I've never had jackfruit before, but this looks absolutely amazing!! And I'm totally a huge fan of black sesame seeds. Love the flavour and texture they add! Wait, these look INCREDIBLE! So excited to try cooking with jackfruit- definitely something new for me! Wow! This looks great! I love that you added so many more veggies to your sandwiches. The slaw sounds great! I've been hearing all about jackfruit! I need to try this! This looks really delicious. I've seen jackfruit a couple of times but never really thought about cooking with it. This looks really awesome. I've seen jackfruit a couple of times but never thought of cooking with it. Your photos are gorgeous! I love this combination! Looks great.